Many ask us, is it difficult to makes capsules or pills using powdered Chinese herbs? It is actually quite easy to do and has been a popular way to use herbal medication in China for many years. Although in TCM the decoction/medicinal wine process are commonly used when preparing herbal tonics, raw herb formulas can easily be made into pills or capsules. Many who find the whole decocting and aging process simply too much of a bother, can prepare their raw herb formula into pills or capsules. And, although assimilation is somewhat slower you can still be assured the formula will be just as effective as if it were prepared as a decoction or medicinal wine. How are pills made? The herbs in your raw herb formula must be ground down into a fine powder (by us or you can use a kitchen blender or coffee grinder). If you’re powdering the herbs at home, don’t dump all the herbs into the blender at once, first cut the bigger sticks and branches into smaller pieces and blend those, and as they are a harder substance expect this to take a few minutes, then add in the small leaves, seeds, and flowers (which are much softer and will blend quickly). The resulting powder should be mixed with a viscous or sticky medium, rolled in the palm of your hand and shaped into a “pill” form and allowed to dry. The dried pills can be stored in the refrigerator for several weeks. Typical dosage is 1-3 pills 2 or 3 times daily but check the specific guidelines (on our invoice) for exact dosage. How are capsules made? It may seem complicated but it isn’t; the herbs must first be ground down into a fine powder (by the herb supplier or you can use the kitchen blender or coffee grinder). You’ll need to purchase 00-sized gelatin capsules and, simply pour the powdered herbs into the 00-sized capsules. The capsules can be stored indefinitely in a tightly sealed glass container (do not store in the refrigerator). Typical dosage is to take 1-3 pills 2 or 3 times daily but check the specific guidelines (on our invoice) for the exact dosage. Will it be as effective as a decocted tea? Yes, as long as you follow each step in the process correctly, use raw herbs that you are certain are of the highest quality and you will achieve the desired effects. Do I chew the pill or swallow it with water? Some do chew the pills, because the typical handmade pills are bigger than a 00-sized capsule, which makes them almost impossible to swallow. We get around that issue by cutting the pill in half or into quarters which makes them easier to swallow. This is probably why most people just make capsules; 00-sized caps are certainly much easier to swallow. What about special preparation instructions? Many herbal formulas that are made into pills or capsules mention dipping an herb first in vinegar or another substance. To do this, just put the herb into cider or distilled vinegar for as many times as the instructed. Allow the herbs to completely dry before grinding it in your blender. Is this still considered a “traditional” method of preparing an herbal formula? Yes, traditionally many herbal formulas were prepared as pills; however, in modern times the capsule method has become the preferred method, and both can be used without any fear of compromising the effectiveness of the formula. 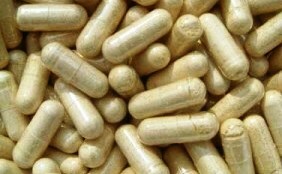 We sell 00-sized capsules in packages of 500 or 1,000 capsules; choose whichever fits your budget. This product is selectable by the number of capsules purchased, either 1000 capsules per bag&nb..